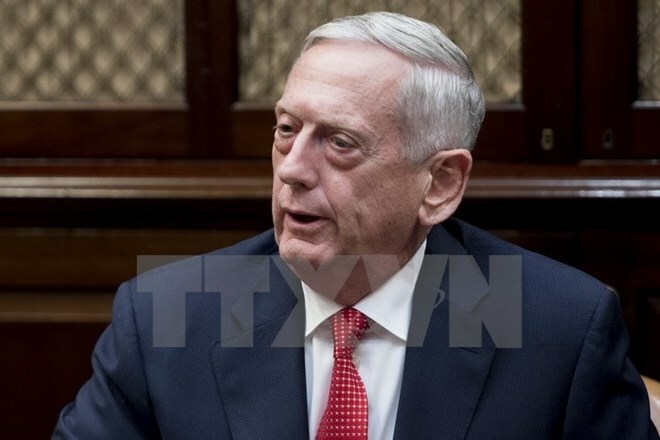 Jakarta (VNA) – US Defence Secretary James Mattis met with Indonesian Foreign Minister Retno Marsudi upon his arrival in Jakarta on late January 22 for a three-day visit to the Southeast Asian country. The visit aims to strengthen the bilateral defence cooperation, according to Spokesperson of the Indonesian Foreign Ministry Arrmanatha Nasir. During the over 40-minute meeting, the two sides discussed Afghanistan’s issues as Indonesian President Joko Widodo is due to visit Afghanistan and other southern Asian countries this week. They also discussed efforts to create a peaceful and stable Indo-Pacific region. Retno said Indonesia is willing to negotiate with any countries, including the US, to promote the building of Indo-Pacific into a peaceful and stable region. The establishment of regional architecture should be based on cooperation and dialogue, she noted. The Philippine minister also reiterated the country’s stance on the Palestine matter and expressed regret at President Donald Trump’s decision on Jerusalem. She asked the US to reconsider the decision to cut funding for the UN Relief and Works Agency for Palestine Refugees in the Near East (UNRWA). During the visit to Indonesia, the US Defence Secretary is scheduled to meet with Indonesian President Joko Widodo and his counterpart Ryamizard Ryacudu to discuss measures to boost cooperation in building a peaceful, stable and prosperous Indo-Pacific region.